So, it’s Saturday and I’m working. We just started being open on Saturday’s and the managers rotate, so I end up working like every 8 weeks, but it’s a beautiful day today! I think I’d be stuck inside at home anyway because I was up all night with Caitlyn who was puking her guts out and had a 103.5 temp. Fun times! She was down to 99 when I left this morning, but now she’s back up at 104. Ed is giving her popsicles to try and hydrate her and she just had more Motrin. My poor poor baby. The kids have had a great couple of days swimming in their new pool out back, which is complete with a whale shaped slide. The only thing is that they don’t like having the hose on to keep it wet, so we have to dump buckets of water down the slide so that it works. Matt came over last night to pick up his toothbrush and played with the kids for a while. Caitlyn, who normally despises him, was all over him laughing and giggling. I think she made his night. He also played shuffleboard with Eddie in the basement after Ed left, which made Eddie’s night. And one week from today Matt will be married. I can’t believe it. It’s all very exciting. I don’t think we have any plans tomorrow so I’ll be catching up on housework and whatnot. I think it’s supposed to thunder anyway. I’m hoping that next week leads to some more profound entries, but right now I am just too tired to think. 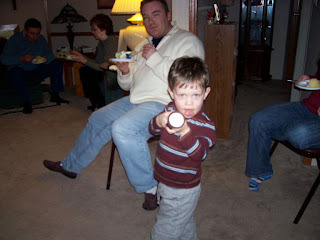 I’ll end with a picture I just found from Eddie’s b-day party in January, which totally captures his mischievous essence.